Ice and snow accumulating on your roof or inside your gutters can cause costly water damage to your home or business. WarmlyYours Ice Shield Roof & Gutter Deicing Cable System provides a reliable solution for ice damming that occurs in gutters, downspouts, overhangs, valleys, and bottleneck areas between roof features, such as dormers or adjacent rooflines. 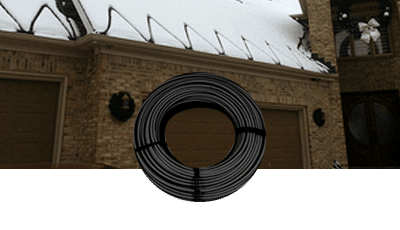 Installing our heavy duty heating cable will give you peace of mind in knowing that your roof will be secure and unharmed by even the harshest winter storms. WarmlyYours offer a self-regulating or constant Wattage heating cable. If you're unsure which one to get, read our blog post on Self-Regulating vs. Constant Wattage Heating Cables to help you decide. These deicing systems are self regulating, meaning the heating cable will increase or decrease its power output (Wattage per linear ft) in response to how cold or warm each section of the cable is. The cable is sold by the foot and and be cut to the desired length. It's available in 120 or 240 VAC. These DIY-friendly deicing kits contain everything you'll need for an easy and safe installation. Each kit includes a fixed-length heating cable, along with clips and spacers used to secure the cable in place. 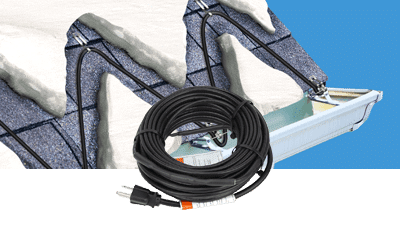 120 VAC system, available in lengths of 30, 60, 80 or 100 ft.
Once you've decided what type of heating cable you'll need to choose a control for your deicing system. WarmlyYours offer a selection of 5 control groups for use with our Ice Shield Roof & Gutter Deicing System, ranging from a basic manual control to our premium option that provides the ultimate in convenience and hands-off operation. We also offer a selection of accessories to ensure your installation process goes as smoothly as it can. Why Install Roof and Gutter Ice Melting? Detects and melts snow and ice, creating a pathway for water to drain properly and avoiding potential damage. Ice, snow and trapped water can cause huge problems, leading to leaks, mold or even roof collapse if too much accumulates. You can select either constant wattage (DIY-friendly) or self-regulating (energy efficient) systems, depending on your project and your needs. Enjoy maximum control of your system with our selection of roof and gutter deicing controls. UL Listed and CSA certified for outdoor use in the US and Canada. WarmlyYours Ice Shield Roof and Gutter Deicing Systems come with a 3-year warranty against defects in workmanship and materials.